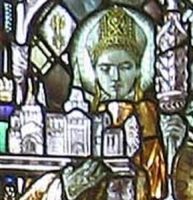 Not long after Chad became abbot, Saint Wilfrid of York was chosen Bishop of Lindisfarne, a see which was soon moved to York. Wilfrid went to Gaul for consecration, and stayed so long that King Oswiu declared the see vacant and procured the election of Chad as bishop of York. Chad felt unworthy, but threw himself into the new vocation, travelling his diocese on foot, evangelizing where he could. When Wilfrid returned in 666, Saint Theodore, Archbishop of Canterbury, decided that Chad's episcopal consecration was invalid, and that Chad must give up the diocese to Wilfrid. Chad replied that he had never thought himself worthy of the position, that he took it through obedience, and he would surrender it through obedience. Theodore, astonished at this humility, consecrated Chad himself, and appointed him bishop of the Mercians in Lichfield in 669. Legend says that on one occasion two of the king's sons were hunting, were led by their quarry to the oratory of Saint Chad where they found him praying. They were so impressed by the sight of the frail old man upon his knees, his face glowing with rapture, that they knelt, asked his blessing, and converted. The pagan King Wulfhere was so angry that he slew his sons, and hunted down Saint Chad for some of the same. But as he approached the bishop's cell, a great light shone through its single window, and the king was almost blinded by its brightness; he abandoned his plan for revenge. During storms, Chad would go to chapel and pray continually. He explained, "God thunders forth from heaven to rouse people to fear the Lord, to call them to remember the future judgment…when God will come in the clouds in great power and majesty to judge the living and the dead. And so we ought to respond to God's heavenly warning with due fear and love so that as often as God disturbs the sky, yet spares us still, we should implore God's mercy, examining the innermost recesses of our hearts and purging out the dregs of our sins, and behave with such caution that we may never deserve to be struck down." NOTE: I get the occassional email from visitors asking if Chad is the patron of elections, disputes, disputed elections, losers, or some other element related to 2000's disputed American presidential election. I have absolutely no evidence that there are patrons of elections, and certainly none that Chad has anything to do with it. It was not until 31 October 2000 that politicians and elected officials received a patron, and that's Saint Thomas More. Times were rough in 7th century England, but I have no record of Chad hanging, dangling, dimpled or pregnant. As you see above, he was involved in a disputed election, but no patronage tradition resulted. Also note that when a dispute arose, Chad stepped aside for the greater good. Wish our current politicians had such grace; but no one ever accused them of being saints. She first tried to join the Carmelites, was refused, and when she was finally accepted at age 19, became so sick that she was forced to return to her family. When she recovered, she began caring for cholera victims, and those even poorer than herself. In 1868 she entered the convent of the Daughters of Charity of Seville, Spain, but again her health failed, and she was forced to return to her parents and the shoeshop. In 1871, with Father Padilla's blessing, she started a plan whereby she lived at home under a particular Rule, yearly renewing her vows. Born a princess, the youngest daughter of King Ottokar I and Queen Constance of Bohemia. Relative of Saint Elizabeth of Hungary. Educated by Cistercian nuns at Trebnitz, Germany. Though she early perceived a call to religious life, Agnes was for years promised into a series of arranged marriages for political reasons. At age three she was promised to a prince named Boleslaus. When he died prior to the marriage, she was betrothed to Prince Henry, son of the Holy Roman Emperor Frederick II. When Henry chose to marry another, young Agnes was betrothed to Emperor Frederick himself. With the help and intervention of Pope Gregory IX, though affronted, Frederick released Agnes from her marriage obligations, acknowledging that he had lost her to the king of heaven. She built a Franciscan hospital on land donated by her brother, King Wenceslaus I. She then established the Confraternity of the Crusaders of the Red Star to staff it and its related clinics. 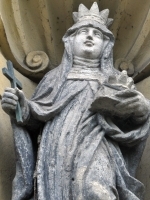 She later built a Franciscan friary, and in 1234, Poor Clare convent of Saint Saviour in Prague (in modern Czech Republic) with the aid of five nuns sent by Saint Clare of Assisi herself. Agnes entered the convent of Saint Saviour herself on Pentecost Sunday 1234, eventually became its abbess, and spent 50 years in the cloister. Agnes was always free with her wealth in service of the poor. She enjoyed cooking for the other sisters, and mending the clothes of lepers. She had the gifts of healing and prophecy, and was given to ecstasies. Though they never met, she and Saint Clare of Assisi kept up an extensive correspondence for two decades, and some of the letters have survived to today. Son of Agathon, the governor of Sarum, and Anohamia, grandson of prince Alidipas, and a member of the Frankish royal family which governed Antioch. Educated in Antioch and the monastery of Saint Maron, studying mathematics, sciences, philosophy, theology, linguistics and scripture. Monk at the monastery of Saint Maron, adding the name Maron to his own. Priest. John studied Greek and patrology in Constantinople. Returning to Saint Maron's, he wrote on such diverse topics as teaching, rhetoric, the sacraments, management of Church property, legislative techniques, and liturgy. He composed the Eucharistic Prayer which still bears his name. Noted teacher and preacher, he explained Catholic dogma to the Council of Chalcedon, wrote a series of letters to the faithful against Monophysitism and Monothelitism, and then travelled to Syria to explain and refute the heresy. Bishop in 676, assigned to Mount Lebanon with a mission to oppose heresies, keep the Maronites united with Rome, and support the faithful in an area being invaded by Arabs. He travelled extensively in the areas involved in combat, preaching, conducting Mass, tending to the sick, and sheltering the homeless. It was during this terrible period that he was given the gift of healing, curing many praying over them. The Maronites made up the bulk of the Maradite army, the so-called "Brass Wall" that shielded Constantinople and the Byzantine empire from Arab expansion. In 685 the Maradites used their power and importance to choose John Maron, one of their own, as Patriarch of Antioch and all the East. John received the approval of Pope Saint Sergius I, and became the first Maronite Patriarch of the oldest see in Christianity. The Byzantine emperor Justinian II feared the growing power of the Maradite army, and was angered that his approval had not been sought for the appointment of John as Patriarch. He sent his army to defeat the Maradites and capture John. They managed to win battles against the Maradites, overrun Antioch, and destroy the monastery there, killing 500 monks in the process. John, however, escaped to Lebanon. When Justinian's army followed, the Maradites, under the leadership of John's nephew Ibrahim, defeated them decisively, sending them home empty-handed. John then founded the monastery of Reesh Moran (head of our Lord) in Kefer-Hay, Lebanon, and moved his see to Mount Lebanon. The Maradites sealed themselves off from the outside, and founded their own national and religious identity, though still part of the Catholic Church, with John seen as one of their great founders. Professed priest in the Congregation of Missionaries of Mariannhill, ordained in 1939 and taking the name Engelmar. Parish priest in Glöckelberg, Czech Republic. Arrested by the Gestapo on 21 April 1941 for the crime of being a priest and preaching against the teachings of the Nazis, he was sent to the Dachau concentration camp where he ministered to other prisoners. He learned Russian so he could minister to prisoners from Eastern Europe. He volunteered to tend to prisoners suffering from typhoid and died of the disease himself. Whatever we do, whatever we want, is surely simply the grace that carries us and guides us. God’s almighty grace helps us overcome obstacles. Love doubles our strength, makes us inventive, makes us feel content and inwardly free. If people would only realise what God has in store for those who love him! Born a prince, the son of King Saint Canute of Denmark and Adela of Flanders. After his father's murder, he was raised in the court of his maternal grandfather, Robert de Frison, Count of Flanders (part of modern Belgium. Fought in the Second Crusade. Succeeded Robert II as count of Flanders in 1119. Married into the family of the Duke of Clermont (in modern France. His rule was a continuous defense of the poor against profiteers of his time, both clerical and lay. Called the Good by popular acclamation. Reformed laws to make them more fair, supported the poor, fed the hungry, walked barefoot to Mass each day. Martyred in the church of Saint Donatian of Rheims at Bruges by Borchard, part of a conspiracy of the rich whom he had offended. Educated by the abbot of the monastery of Saint Philip at Agira, Sicily, Italy. Monk at Agira. Priest. Reluctant abbot of his house. Lucas eventually, for unknown reasons, went blind. One day while they were travelling to Nicosia, one his monks tried to play a trick on the blind abbot by telling him that some towns-people were following them in hope of hearing him preach. Lucas stopped, turned to where he was told the people were standing, and began to preach to the empty field. When he finished, the stones along the road all shouted "Amen", confounding the practical joker. A church dedicated to Lucas was later built on the spot. Moved from Britain to Brittany to become the spiritual student of his uncle Saint Paul Aurelian. Monk at Landevennec, Brittany (in modern France). Co-adjutor bishop with, and successor to Saint Paul. At least two churches in Brittany are dedicated to him. Raised a Christian. Immigrated to Aeolis in Asia Minor, and developed a ministry of serving the poor. Arrested and tortured for refusing to made sacrifice to pagan idols during the persecutions of Marcus Aurelius; his ability to work miracles had drawn the attention of the anti-Christian authorities. When he was released, his wounds were instantly healed and he immediately returned to caring for the local poor. Born to the nobility, a member of the family of the Dukes of Savoy. Soldier. Joined the Mercedarians in Barcelona, Spain on 25 March 1542. Received visions of the Blessed Virgin Mary to whom he was extremely devoted. Wrote in defense of the dogma of the Immaculate Conception. Some accounts describe him as bishop of Teruel, Spain, but that diocese had not been established during his lifetime. Born to the nobility, the brother of Saint Chad and Saint Cedd. Educated at Lindisfarne by Saint Aidan and Saint Finan, and then in Ireland. Priest. Evangelized the Anglo-Saxons in Northumbria. Founded a monastery in Laestingaeu in north Yorkshire (modern Lastingham), England in 658, and became a monk there. Relative and spiritual student of Saint Columba. Abbot at the monastery of Iona. Bishop of Treves, France in the late 4th-century. Zealous opponent of the Priscillianist heresy. Late in life he retired to live as a monk. Most early records of his diocese were destroyed in the 9th century, and no other information about him has survived. Benedictine monk. Spiritual student of Saint Swithbert. Prior and then abbot of the abbey of Kaiserwerth, Germany. Martyred in the persecution of Valerian. Martyred in the persecutions of Decius. Saint Gregory the Wonderworker wrote about him. Martyred at Caesarea, Cappadocia, date unknown. Monk. Abbot of Iona, Scotland from 752 to 767. Fifth-sixth century monk at Menevia, Wales. Uncle of Saint David of Wales. Approximately 400 northern Italian Christians martyred for their faith by pagan Lombards. Their story was recorded by Pope Saint Gregory the Great, who reports that they people spent their final days supporting each other with prayer. Group of Christians martyred in the persecution of Diocletian. The only other information that survives are the names of four of them - Heraclius, Januaria, Paul and Secondilla.